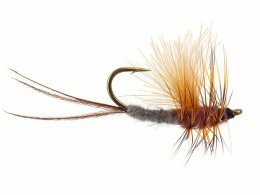 These 49 fly patterns in CDC (Cul de Canard) are incredibly effective models, designed by Mauro Rauspini, using new tying techniques, new materials and most importantly the Cul de Canard, which is employed in the most sophisticated way. Mauro Raspini is one of the world leading fly tiers. He reworked 49 of the strongest classic fly models introducing CDC only where its characteristics are in harmony with the traditional model chosen. This is done to better the effectiveness of the model and its simplicity of use. We are proud to have the exclusive right to tie and sale these high quality CDC flies designed by Mauro Raspini. We also strongly recommend the fly tying book "CDC Evolution", pubblished by Fly Line, available directly in our online shop.